While decorating his famed Glass House in the 1950s, architect Philip Johnson removed a candelabra from the sitting area to make way for a less intrusive piece. Only, it didn’t yet exist. In collaboration with Richard Kelly, he designed a tripod floor lamp, one of the few pieces of furniture Johnson ever made and of which only a few exist today. The newly opened Converso showroom in Los Angeles – the New York- and Chicago-based furniture dealer’s LA debut – features the rare lamp design, alongside other pieces by numerous stars of 20th-century design. Converso’s established presence in the design havens of Chicago and New York motivated a leap to the West Coast. ‘There was a different vibe around Los Angeles than anywhere else – a sense of optimism,’ founder Lawrence Converso explains in a statement, also noting his own frequent trips to the modernist mecca of Palm Springs. The opening of the new location comes hot on the heels of Converso’s first showing at Design Miami with a group of never-before-seen pieces by southern Californian icon Albert Frey. The new showroom announces itself with an assemblage of hard-to-find and historic gemlike pieces. 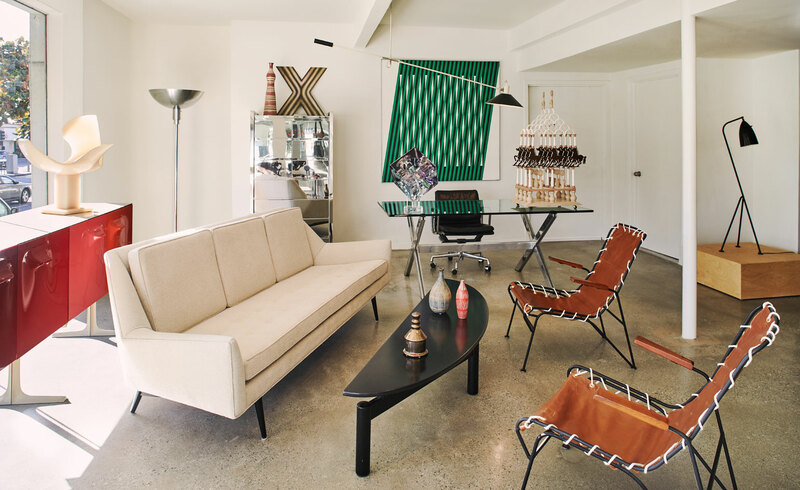 The 2,200-sq-ft space on Beverly Boulevard is united by statements across a variety of genres and periods, further punctuated by bold hues and natural materials. A pierced stone table by Noguchi joins an Eames ‘ESU’ bookcase; a wooden George Nakashima long chair appears near Mario Minale’s 2007 ‘Red Blue Lego’ chair for Droog. The showroom also engages with of-the-moment design, with a cabinet room dedicated to capsule collections and curated exhibitions, currently housing wooden sculptures by Mario Del Fabbro. Local artist Artsu Ono designed the camouflaged storefront awning, rendered in sandy pink, red and blue to evoke the colours of the California desert, announcing the singular vision inside.